The question is this: which instruments and what dredging regime is most appropriate for environmental remediation of the Riachuelo, and what will the resultant canal landscape be? Admittedly, identifying the specific actual dredger and regime to be used is outside the scope of this project. However, be considering the different types of machines and the landscapes they create through the mobilization of sights, sounds, materials, and a whole host of equipments and their concomitant expertise, we can identify desired results and causal relationships with specific instruments. This will allow us to speculate on the type of dredge instruments to be used, and how, and therefore test our thesis of landscape instrumentalism with a specific design proposition. 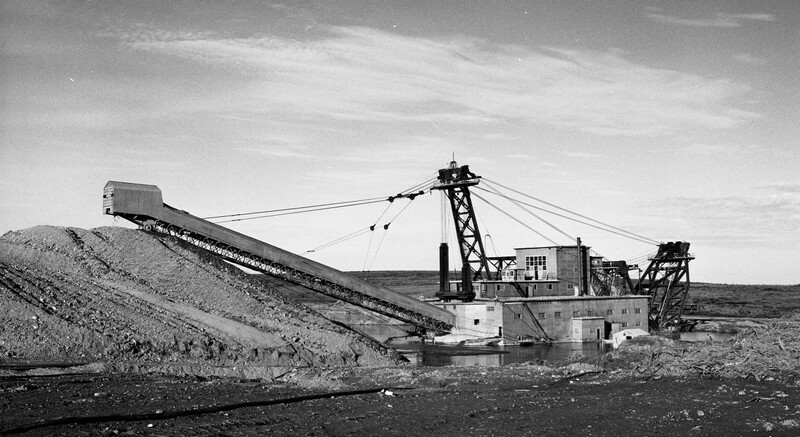 In their most basic incarnation, dredgers are simply machines used for underwater excavation. Applications include the improvement and deepening of shipping channels and ports, land reclamation, excavation of minerals, and environmental remediation. There are three basic types: hydraulic dredges, mechanical dredges, and hydrodynamic dredges. All three types engage in acts of dislodging, lifting, transporting, and disposing; mostly of a slurry composed of sediments and water from the bottom of the targeted waterway. Each dredger is an assemblage of equipments and instruments including barges, hoses, cutters, hydraulic arms, pumps, and engines to name a few. In this way, discreet acts of dredging can be thought of as instances of accelerated geological processes. Considered from a materialist perspective dredging can be a generative act; the machines, equipments and specialized knowledge of the operator enter into a sort of duel or partnership with the water- its currents, chemicals, and biologies- and the sediments with its silica, organic matter, and toxic compounds. Dredgers are typically imagined as landscape-building machines, used for beach nourishment and building new islands, cutting deeper channels and widening shipping ports. Landscape instrumentalism is interested in the ways that the act of dredging itself generates landscapes- the movement of the dredger, sediments, the knowledge of operators and fleeing of local schools of fish all swirl together to create a violent and dynamic processual landscape. Dredging operations are paradoxical by their nature. Conceived as a specific linear process outlined in the above four steps– dislodging- raising- horizontal transport- final placement– these operations are nonetheless part of a larger network of relations that feed back in to the newly created situation, often working to undo the original intentions of the dredging program; the channel begins to resilt due to the construction of steeper banks and exposing of destabilized sediments to still-active erosive currents. 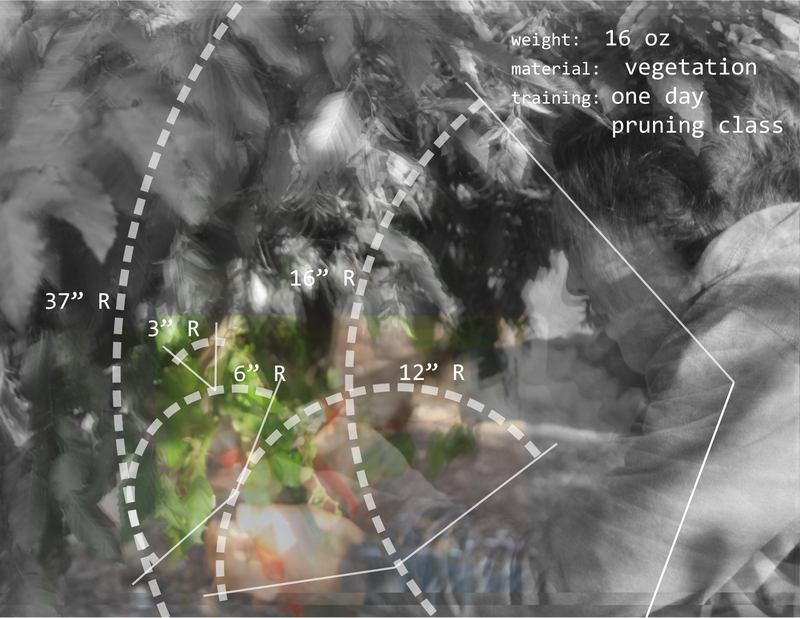 Every act is a spicy mix of human intentions and hard-headed ecologies and geologies pushing against one another. Because of this, discreet dredging acts are necessarily part of a larger regime of dredging that works over time to counteract or harness the larger forces at work- ocean currents, river flow, meteorological events, specific geology, and local structures. A dredging regime must attempt to comprehend these relations that are external to the discreet dredging operation and counteract or exacerbate them through an extended account of time and space which transgresses the limitations of scope and scale established through accepted engineering science [limitations which are necessary to ensure that measured goals are met within acceptable means and methods]. + the clearing of the camino de sirga by ACUMAR. The camino de sirga, spanish for “canal tow path”, is to be cleared of private constructions and opened for pubic access to the Riachuelo. The camino de sirga is defined as a 35 meter setback on either side of the canal. Sediments: The Riachuelo currently transports approximately 320,000 m3 of sediment per year. All of this is considered contaminated and much of it is dredged by the Port Authority of Argentina and confined at the Yarara disposal side on the river side of the petrochemical dock in the port. Historical deposited sediments in the Riachuelo, all heavily contaminated, vary from 1′- 14′ feet thick. When still maintained for port operations, the depth of the Riachuelo was 24′. Instruments: The geology of the river basin suggests that dredging operations can be carried out most effeciently- the most amount of sediment can be moved with the least amount of effort- with a hydraulic dredge such as a cutter suction dredge. However, a dredging regime also needs to consider: safety of users and neighbors, noise, horizontal transport of sediments, mixing of soil layers, creation of loose spill layers, and dewatering or treatment method. 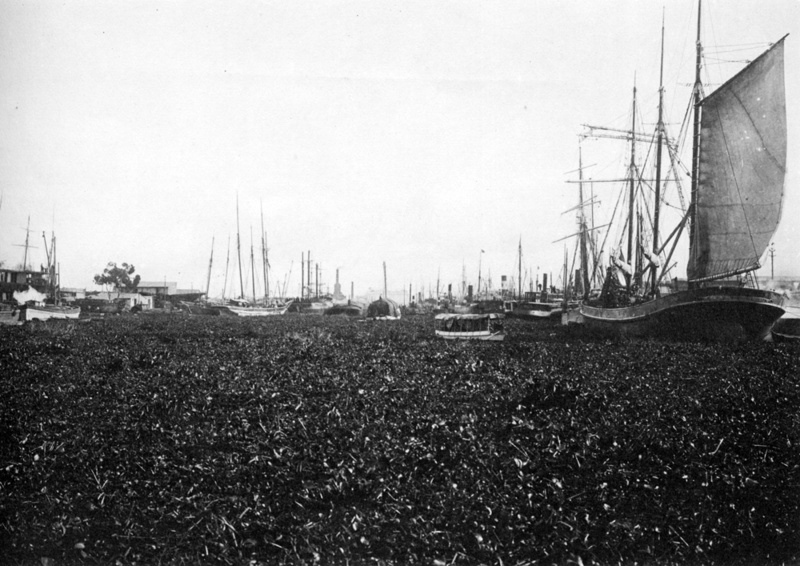 Given the proximity to dense populations to the canal, the likelihood of encountering large voluminous objects in the sediments (such as cars and mopeds), the continual and extended need for dredging, the distance from a disposal site, limited disposal space on the banks for dewatering and treatment, the need for precise maneuvering, and the desirability of opening the canal to municipal navigation for reasons of tourism and transportation, the needed instrument would likely have an articulated arm with grab capabilities and be capable of maneuvering without a tug boat. Conclusions: A mechanical dredge will be fitted out and deployed in the canal- constantly making the canal landscape- size to be determined. It will work on a yearly cycle that must be developed in consideration with strategies for stormwater and upstream siltation, flood events, adjacent urban populations, existing contaminants, noise pollution, river ecosystems, new contaminant sources, and containment and disposal of sediment. This dredging regime will be implemented in accordance with a larger project and program (which is currently being hatched). 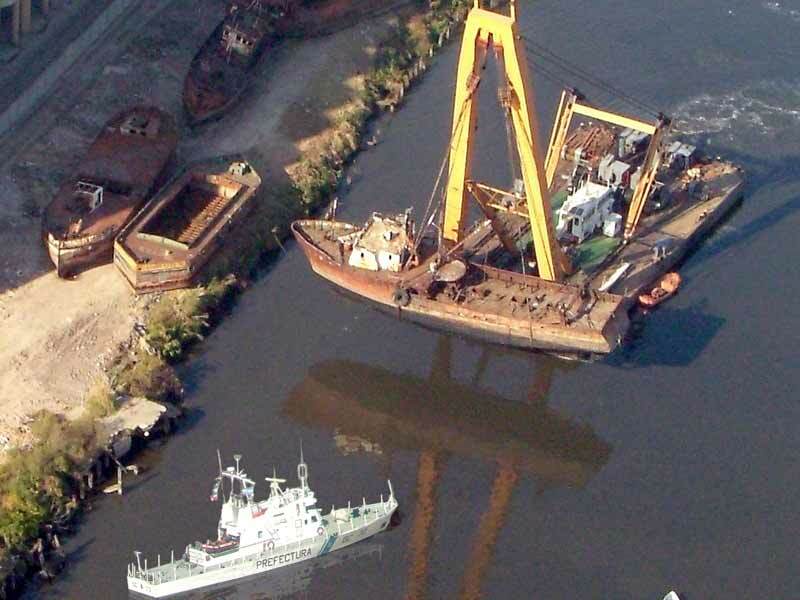 the Prefectura Naval (Argentine Navy), alongside the river basin authority ACUMAR and the Environmental Ministry, pulls sunken boats from the Riachuelo and stacks them on the future camino de sirga; the question, of course, is "what kind of massive hulking floating-bridge-barge-type-thing is that?" 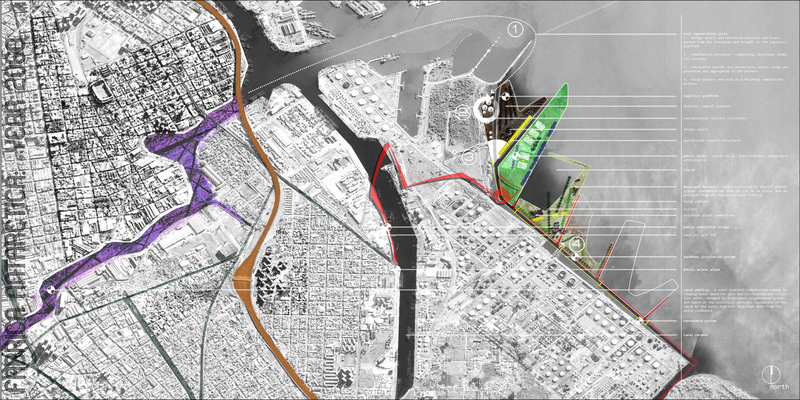 Proposing a public space project that aims to mesh industrial scale environmental remediation operations with all its noise, heavy machinery, danger, and restrictive skill sets with recreational programming that is typically more open, pleasant, and easy demands an honest reckoning with the question- WHY? Why try to mesh picnicking with dredging? Why not just keep things separate- let the park under construction remain walled or fenced off; keep the superfund site out of public view until it is cleaned up and ready for public consumption as new high-rise condos or waterfront parks? In addition to the problem of perception (these places can seem chaotic, dangerous, smelly- not the ideal place for a waterfront stroll or the image many bureaucrats or real estate developers are interested in projectng), there are very real issues of safety liability. A general contractor or municipal agency doesn’t want a happy couple blithely wandering into the operating radius of an articulated back hoe in operation, or traipsing through a puddle of coal tar residue. I propose that Landscape Instrumentalism can contend with these issues- with this question of why- within a tripartite framework: economic, aesthetic, and political. From an economic perspective this approach allows forms of occupation during the construction and maintenance processes. In the aesthetic realm it harnesses and claims the affects of the technological sublime, or at least aspects of it, and to engage their historical importance in the American psyche. Politically, it enlarges the types of agency in the public realm to actors typically limited to acts of consumption. Landscape instrumentalism is concerned with extensions and expansions of norms of behavior as well as spatial syntax. The intended result is not only the creation of richer, more meaningful experiences, but also more space. Economic value is the result of two main factors- use value and exchange value. Following Marx, a commodity is something that is defined by its exchange value, whereas use value is the aptness of an object for a particular task- you buy a shovel because of its usefulness for a task, not because you can later exchange it. Landscape projects have a life cycle which includes the construction and maintenance of the project. Typically a public landscape is only public after construction or maintenance operations are completed. Future users are kept at bay until a “substantial stage of completion” is reached, or until the mowing is finished. 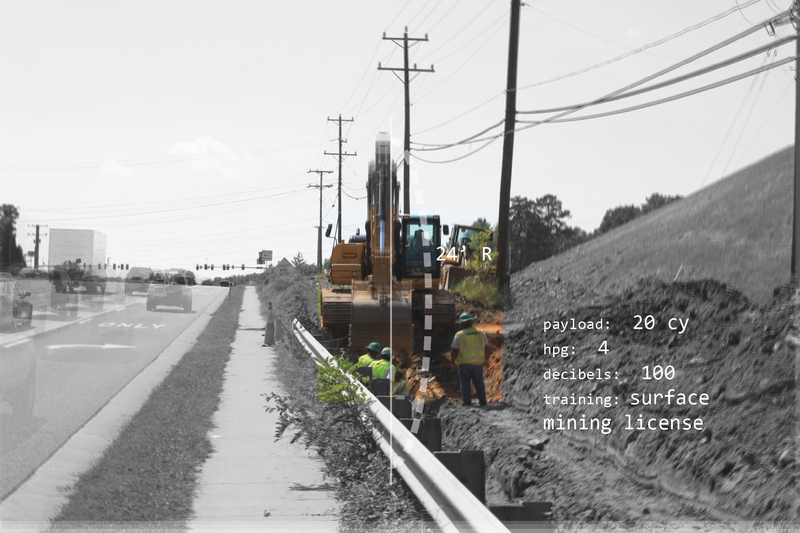 For large projects, this can mean that significant portions of the project are not usable for months, years, or in the case of a place like Fresh Kills, decades, a result that is typically mitigated somewhat through phasing the implementation of a project, or by instigating intermediate and provisional programs. 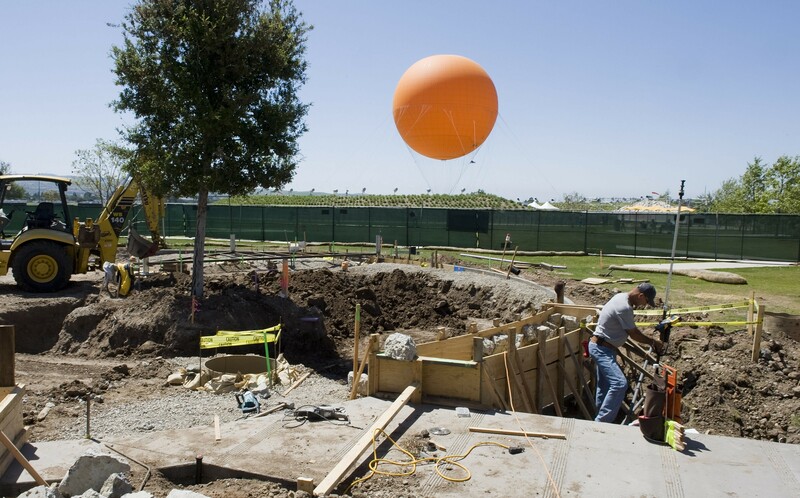 In the case of smaller projects- a playground or neighborhood plaza- this means that the project is often closed for a season as new play equipment or plantings are installed, grading and drainage pipes are reconstructed, or fencing is replaced. Taking the middle ground as a representative example, a neighborhood park is often closed for a year while undergoing construction or reconstruction that costs 2 million dollars. We will calculate maintenance and operation costs at 5% per year (this can vary wildly and is used here only to make a point), bringing our total cost for the park over its lifespan to 4 million dollars. In New York City, these places are typically reconstructed once a generation due to economic and social cycles (baseball becomes less popular, the equipment is worn out, and the city parks department has more money, for instance). Additionally, closures for seasonal maintenance such as reseeding, tree pruning, or the regrading of the infield adds up to another year of closure over a generation and cost an additional 10% per year. This means that roughly 10% of the use value of the park (2 years in 20) is lost; in our case that translates to 400,000 dollars. 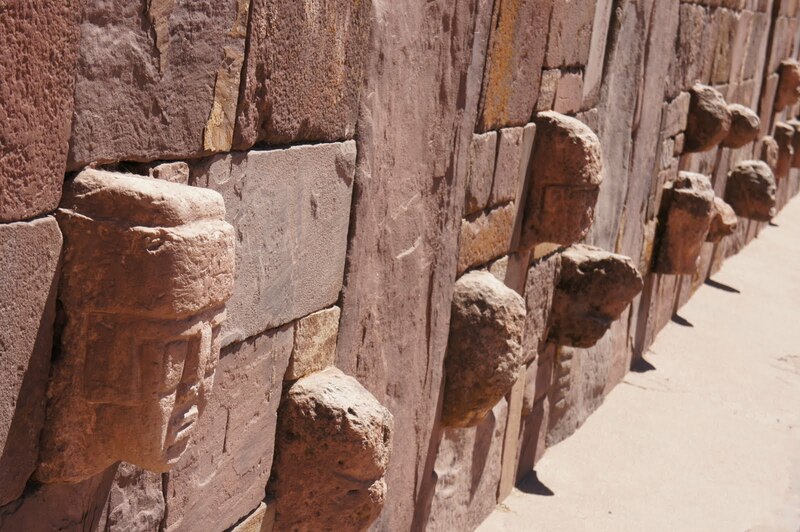 In more extreme cases where major urban infrastructures are adjacent, above, or below the site these periods are often more unpredictable and protracted. If a sewer main is being reconstructed, a road enlarged, or an exit ramp realigned, the loss of use value can be 20-40%. The recovery of this use value could have significant economic impacts. If designers develop and propose methods for capturing the use value of these public spaces, even at some initial additional expense, the result would be a net gain. 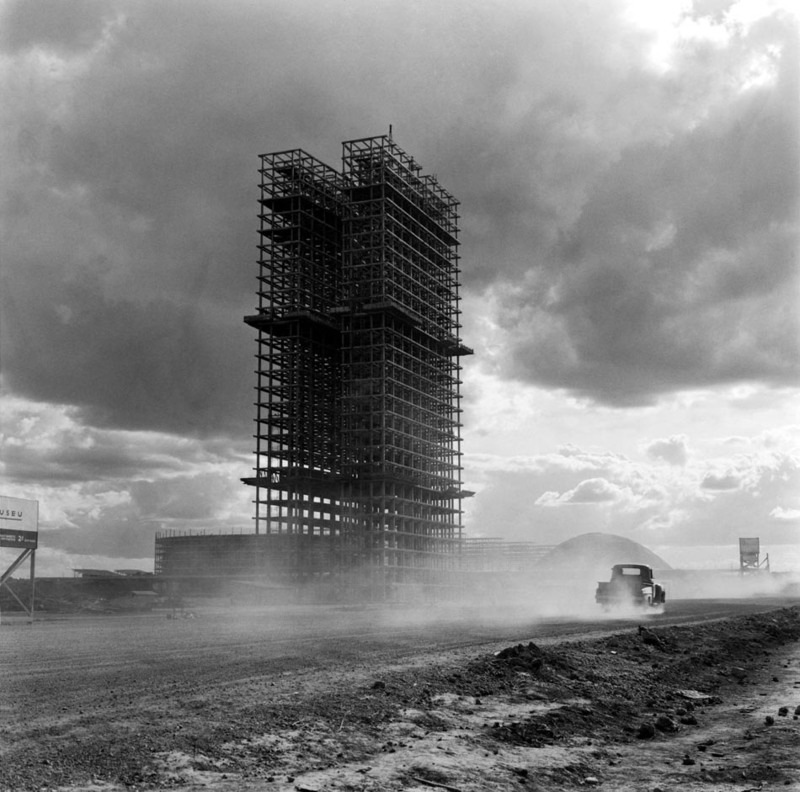 This can only be achieved through a materialist approach, wherein the material is taken as the physical landscape, the social desires, and the operation of the construction and maintenance machinery and procedures. It is possible that a focus on instrumentality in the design process is the appropriate materialism for this situation. Landscape as aesthetic experience suggests some understanding of the European art-historical concepts of “beautiful, picturesque, and sublime”. At its most basic, the sublime can be understood as an experience of astonishment, meaning “that state of the soul in which all its motions are suspended, with some degree of horror. In this case the mind is so entirely filled with its object, that it cannot entertain any other, nor by consequence reason on that object which employs it,” (Burke, On the Sublime). Immanuel Kant claimed that the sublime experience could be either mathematical (an encounter with extreme magnitude or vastness) or dynamic (the contemplation of a violent scene by a bystander who is safe from danger). In The American Technological Sublime David Nye asserts the historical importance of the sublime aesthetic in the American landscape, noting that “ever since the early national period the sublime has served as an element of social cohesion, an element that was already quite evident when the first canals were dug and and steam engines were first harnessed to trains,” (p XIV). Nye’s major contribution was to recognize that especially within the American psyche, the sublime experience was not at all limited to natural or ruined classical forms but could be an “amalgamation of natural, technological, classical, and religious elements into a single aesthetic,” (p 23). Importantly, he makes the connection that the technological sublime is concerned with a politics of perception. The public’s experience of technologies in operation can create specific, attractive effects; a landscape of the technological sublime can offer aesthetic experience that doesn’t privilege the beautiful or the picturesque. I do not claim that machinery operating in the landscape is always a case of the technological sublime. Issues of scale, perceived danger, familiarity, and semiotics all effect the resulting experience. However, an appreciation of and engagement with the technological sublime by landscape-makers can create landscapes that offer the public aesthetic experience beyond the scale and range of the waterfront park or the panoramic promenade with industrial ruins employed as stylized tropes. The right to the city is understood here as the right of urban inhabitants to engage with all of the decisions and actions that produce urban space. This includes the traditional right of participation as well as the more radical right to appropriation. In the first case, inhabitants’ desires and ideas are filtered through institutions of the state- people vote for a mayor who appoints public commissioners who mobilize a bureaucracy to design and implement promised visions: build new schools, remake the local football field, create a bike lane system. The second right is a bit more tricky. There are very good reasons that the right to appropriation is not legitimized to the same degree as the right to participation. A New York City in which anyone who wants can go around blasting holes in the sidewalk, ripping up sections of Broadway, or planting new trees in the middle of the Long Meadow in Central Park would be problematic, if exciting. And so the default is to totally deny this impulse, despite the violently negative ramifications it inflects on our democracies and urban spaces, elucidated so brilliantly by Henri Lefebvre (and others, including Mark Purcell and David Harvey). The practice of landscape architecture traditionally reinforces this divide, with its practitioners and theorists working as functionaries for the walling off of material-instrumental acts in the landscape, making them the preserve of technocrats, experts, politicians, and their wealthy patrons. The results have disastrous consequences for politics of power in democratic urban spaces, often resulting in bizarre and inappropriate definitions of “successful”, “good”, and especially “public” spaces- it is fundamentally a destruction of space. Despite this institutional weight, people still clamor and realize their right to appropriation; mass occupations and protests occasionally occur, graffiti has been elevated to an art, food trucks set up shop until they’re made to leave, and leftover “vague terrains” are captured by opportunistic communities because no one else cares enough to kick them out. 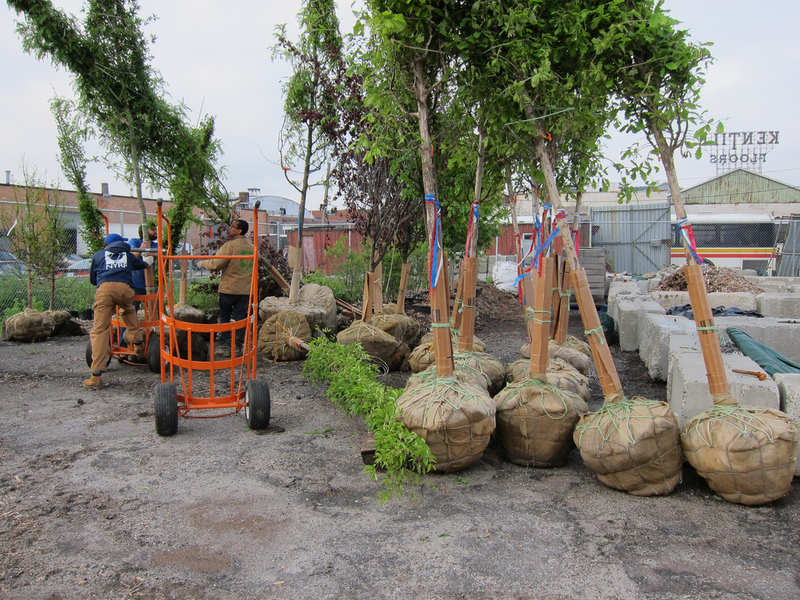 While claiming interest in these efforts- bottom up initiatives, emergent programs and ecologies, etc- the landscape design profession offers precious little in terms of new forms and programs that might honestly grapple with these serious issues. This is not through negligence or malfeasance. Rather, we have not developed the method for devising these new spaces, and so we end up making parks and promenades with stylistic flourishes. Coming back to the original question of WHY, I hold out hope that landscape practice can embrace these conflicts and potentials latent in public landscapes and develop a method for creating space. The design, construction and maintenance of public spaces exert real demands and create real conflicts among various materials, actors, and agents- there are good reasons that things work as they do. However, considering the detrimental ramifications of this way of working along with the latent opportunities embedded in the economic, aesthetic, and political aspects of these places, I believe there is a need for a method to confront these situations and contend with these issues, and that a landscape approach can be developed into this methodology. 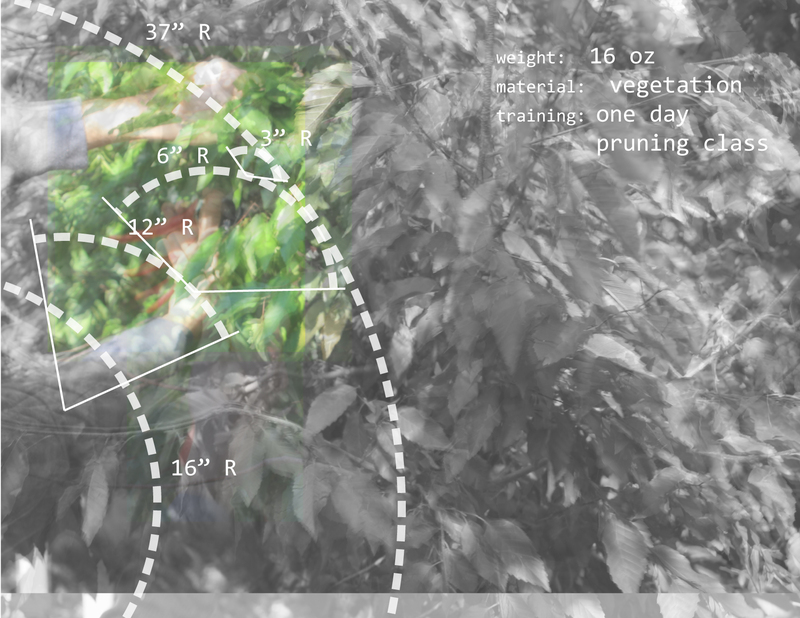 Instrumentalism holds that “the activities of thinking and knowing occur when an organism experiences conflict within a specific situation.” This project of landscape instrumentalism is meant to explore a method for confronting these issues and negotiating these situations. the operating backhoe adjacent to the city sidewalk and the cars of highway 29 creates a moment of interest, and pehaps perceived danger on the road. Here the backhoe is being used to excavate a trench for a sewer pipe. It is then used to lower segments of the precast pipe into place with a cable attached to the articulated arm, while workers shuffle around its bucket shovel to guide the pipe segment. Cars and people pass only a few feet away; admittedly many more cars than people while an ailanthus tree sprouts in the forground, protected from trampling by the guardrail. The powerful, graceful movements of the triple-articulated arm of the backhoe works steadily to excavate the land it rests on; the views it frames, the raidii it creates, and the interaction moments with people, machines, and material work to generate landscape while excavating for building footers or utility pipes. The process of the backhoe excavating and dropping its payload into an earthmover not only changes the actual ground in the fore, it frames and activates the background and the atmosphere, releases dust and earth into the air and heaping piles of dirt around the exchange point; the specific arcs and lines created by the operating tools are the objects that work to create this provisional landscape. These instances of instrumentality as a material practice are representative examples meant to examine activities operating at different economic, expertise, and spatial scales: the operation of backhoes and construction of commercial research facilities are typically considered industrial operations, whereas the use of felco pruners are usually a maintenance or recreational activity. The working of these tools lends an immediacy and agency to the inhabitants of the landscape- it is a form of actualized potential. The confrontation between material and tool creates views, establishes safety zones, demarcates areas for working and walking, and generates new habitats and materials. 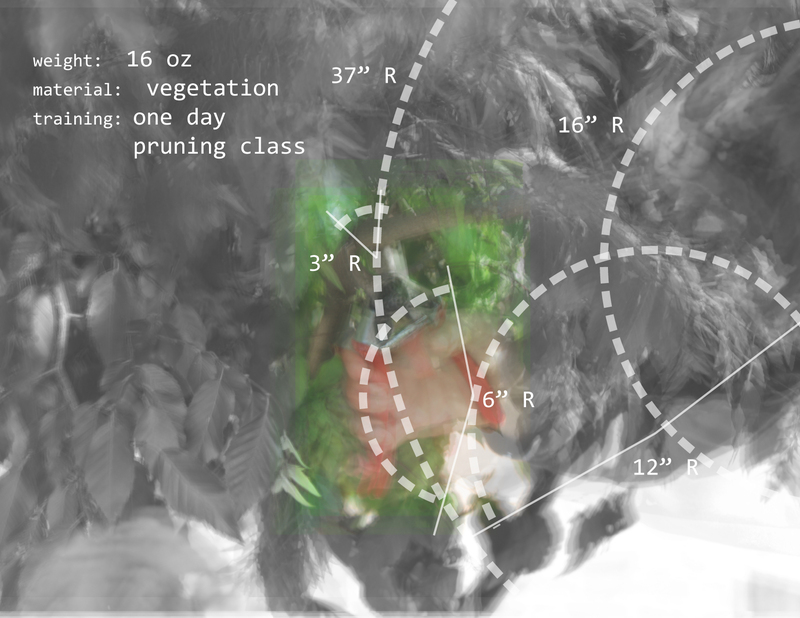 conclusion: Two facts germane to a working theory of landscape instrumentalism immediately spring to the fore through this study- 1) the engagement of machines, tools, and implements can create and generate landscape; framing views, making micro-topographies, habitats, new forms, and 2) the disparate scales must immediately be grappled with. Our representational technique seemed interesting when dealing with a large landscape in general stasis, but when the landscape was a single tree canopy and small scale tool moving all over the place the effect is nauseating. Can environmental remediation operations generate the conditions for industry and recreation along the canal? 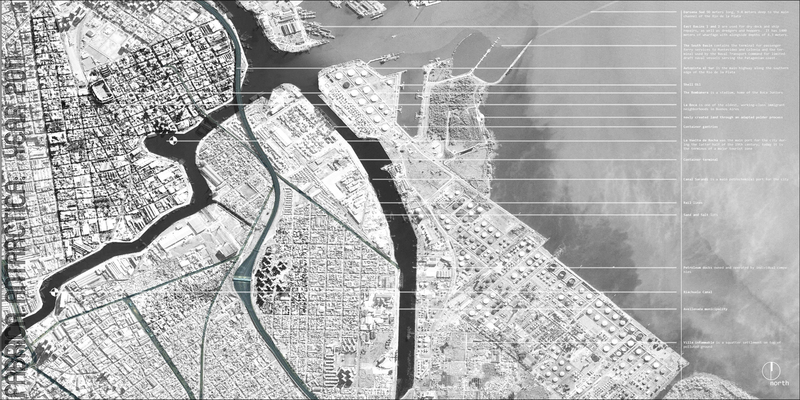 To start the project; a speculation on the potentiality of the canalized portion of the Riachuelo in Buenos Aires, Argentina. The project proposes that the environmental remediation operations necessitated by the federal court “Mendoza” decision of 2008. The operations are to intended to be carried out by the river basin authority, ACUMAR. This speculation proposes the humble water hyacinth and the rumbling dredge to generate a series of ephemeral landscapes in the canal and at the mouth of the river. The intent is to use the speculation as a method for bringing up the right questions. The operations would happen at various scales- picking hyacinth, operating a dredger, conveyor belt systems, sedimentation- over decades. The plan set would necessarily be secondary to continual maintenance and construction processes. View of the Canal from La Boca neighborhood- the water hyacinth overtaking the Riachuelo Canal, generating a new public landscape. 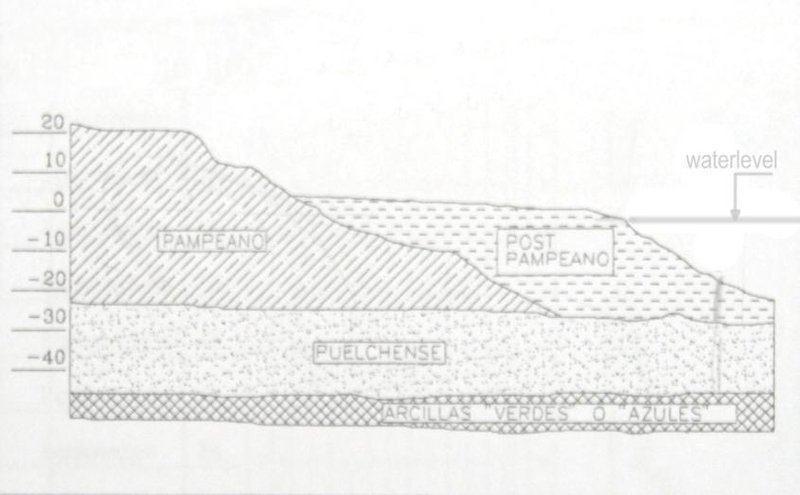 View looking toward the Rio de la Plata- the new poldered lands are organized along a main spine; the spine is a bundle of functions, moving manufactured soil, people, and also separating the public landscape from the petrochemical dock; constructed spurs run between the poldered lands, subject to the flood; the adjacent polders are near eye level and protected from the salin waters of the Rio de la Plata. looking back toward the city from the Rio de la Plata- newly constructed lands provide space for an urban nursery that reforests the city; sports fields, boating areas, and birding also begin. 1. How would people (workers and recreational users) access the canal? 2. What instruments are needed to tend, harvest, transport, and compost the hyacinth? 3. 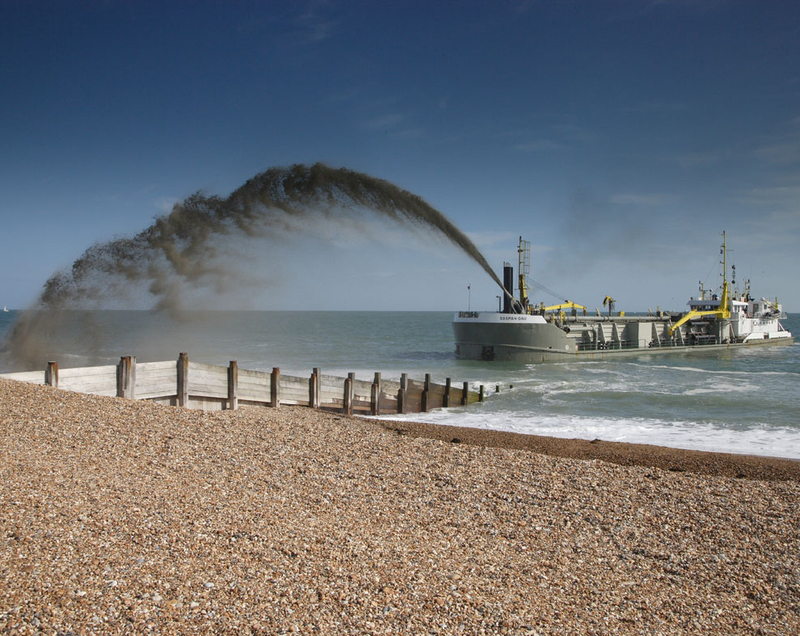 What are the instruments used in dredging? a) How frequently are they operating? b) how is the loading and unloading best achieved? c) what is the best way to stockpile the volume? d) how is the contaminated sediment treated and what are the necessary instruments in this process? 4) What are the space and machine requirements needed to produce manufactured soil?